Foreword (J. Bouma). Preface. Status of pedotransfer functions (Ya. A. Pachepsky, W.J. Rawls). References. Part I. Methods to develop pedotransfer functions. Statistical regression (H. Vereecken, M. Herbst). Data mining and exploration techniques (Ya.A. Pachepsky, M.G. Schaap). Accuracy and uncertainty in PTF predictions (M.G. Schaap).Part II. Soil hydraulic properties: water retention and hydraulic conductivity. Soil texture and particle-size distribution as input to estimate soil hydraulic properties (A. Nemes, W.J. Rawls). Simple parametric methods to estimate soil water retention and hydraulic conductivity (D. Timlin et al.). Effect of soil organic carbon on soil hydraulic properties (W.J. Rawls, A. Nemes, Ya.A. Pachepsky). Using soil morphological attributes and soil structure in pedotransfer functions (A Lilly, H.S. Lin). Soil aggregates and water retention (A.K. Guber et al.). Utilizing mineralogical and chemical information in PTFs (A. Bruand). Preliminary grouping of soils (A. Bruand).Part III. Hydrological and physical parameters. Pedotransfer functions for soil erosion models (D. Flanagan). Solute adsorption and transport parameters (B. Minasny, E. Perfect). Estimating soil shrinkage parameters (E. Braudeau, R.H. Mohtar, N. Chahinian). Key soil water contents (E.V. Shein, A.K. Guber, A.V. Dembovetsky). Part IV. Spatial component in PTF development. The role of terrain analysis in using and developing pedotransfer functions (N. Romano, G.B. Chirico). Spatial structure of PTF estimates (N. Romano).Part V. User-oriented techniques and software. Soil inference systems (A. McBratney, B. Minasny). Graphic user interfaces for pedotransfer functions (M.G. Schaap). Methods to evaluate pedotransfer functions (M. Donatelli, J.H.M. Wösten, G. Belocchi). Part VI. Pedotransfer functions developed for different regions of the world. Pedotransfer functions for tropical soils (J. Tomasella, M.G. Hodnett). Pedotransfer functions for Europe (J.H.M. Wösten, A. Nemes). Pedotransfer functions for the United States (W.J. Rawls). Pedotransfer studies in Poland (R. Walczak, B. Witkowska-Walczak, C. Slawinski). Pedotransfer functions of the Rye Island - southwest Slovakia (V. Štekauerová, J. Šütor). Additional Bibliography (Ya. Pachepsky, W. Rawls). Environmental and agricultural modeling and assessment have a multitude of uses for soil parameters governing retention and transport of water and chemicals in soils. These parameters are notorious for the difficulties and high labor costs involved in measuring them. Good estimates instead of direct measurements may be accurate enough for many applications. Pedotransfer functions provide such estimates by utilizing available soil survey information to translate data we have into data we need. This book is the first book on the topic. 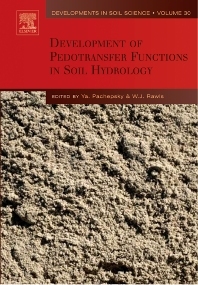 It provides the unique compendium of pedotransfer functions, summarizes the vast international experience in this field, and shows how the value of soil data can be increased by using them in pedotransfer functions to predict soil hydrologic and related properties. The book is a rich source of information crucial for environmental research and applications.